Get around Okaloosa Island with ease! Transportation companies provide cabs, shuttles, busses, and more for simple transport across the Emerald Coast. While most things to do on Okaloosa Island are within walking distance of area condos, hotels, and vacation rentals, transportation is still readily available to all who need it. Whether needing a ride back from the airport, or a cab home after a late-night concert, the transportation Okaloosa Island offers will have you covered! 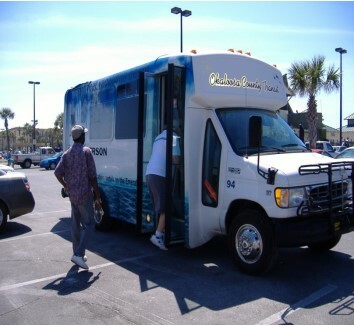 Shopping, commuting, or simply getting from point A to point B, the Emerald Coast Rider can get you there! Avoid the infamous highway 98 traffic and ride on a safe and comfortable bus to your desired destination! thirty-one day passes are valid for thirty-one consecutive days (holidays and weekends included). Disabled citizens are eligible for reduced fare with valid Emerald Coast Rider reduced fare ID card. MEDICARE cards will still be accepted as proof of eligibility for reduced fare. View complete fares and rate charts at Emerald Coast Rider Rates & Fares.